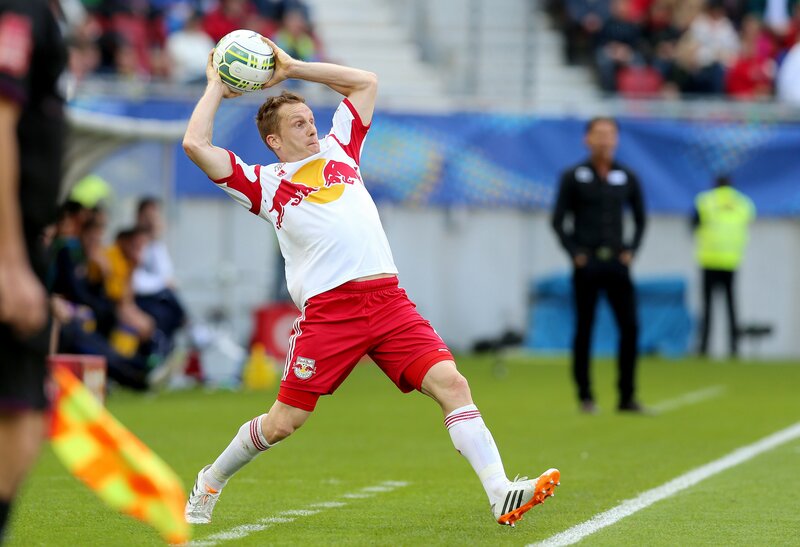 FC Red Bull Salzburg have done it! Jonatan Soriano & Co. won the Samsung Cup final today at the Wörthersee Arena in Klagenfurt 4-2 against SKN St. Pölten to take the double again after their 2012 win! There was little of note in the first half hour of the 79th Austrian cup final – but that all suddenly changed. Alan missed a big opportunity (34’) before Klein put the champions ahead a short time afterwards with a precise drive inside the far past (35’) only for Jano to equalise. 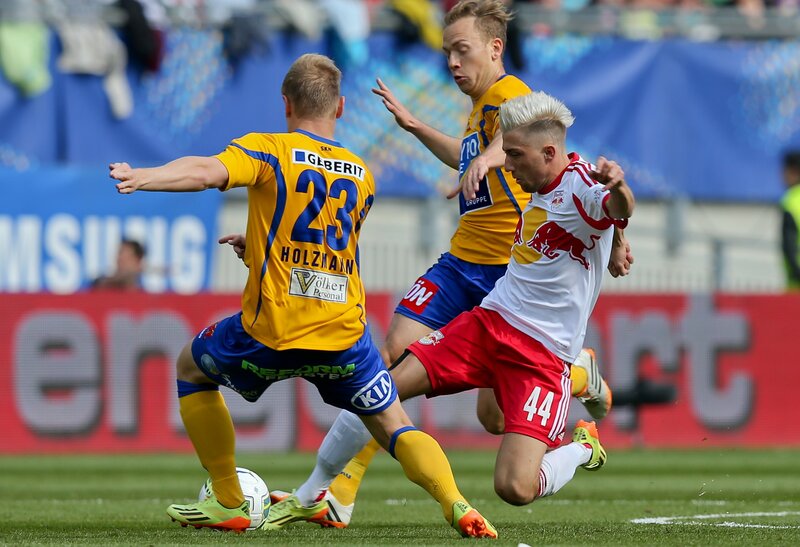 Almost straight away Kampl scored (42’) to put Salzburg 2-1 ahead at half-time. After the break, the Red Bulls needed some time to warm up before a quick Soriano brace (63’, 67’) ensured a clear lead. Noel pulled it back to 2-4 shortly afterwards (70’), but the second tier side could not provide any further resistance. Salzburg were well on top in the final minutes and secured the perfect end to a fantastic season with a cup win. Then came the trophy ceremony, with captain Jonatan Soriano lifting the cup under a shower of applause from the travelling fans. Departing coach Roger Schmidt also got a fond farewell present as he was unable to escape being doused in beer by Andre Ramalho . . .
•	The Red Bulls were today without the suspended Sadio Mane. 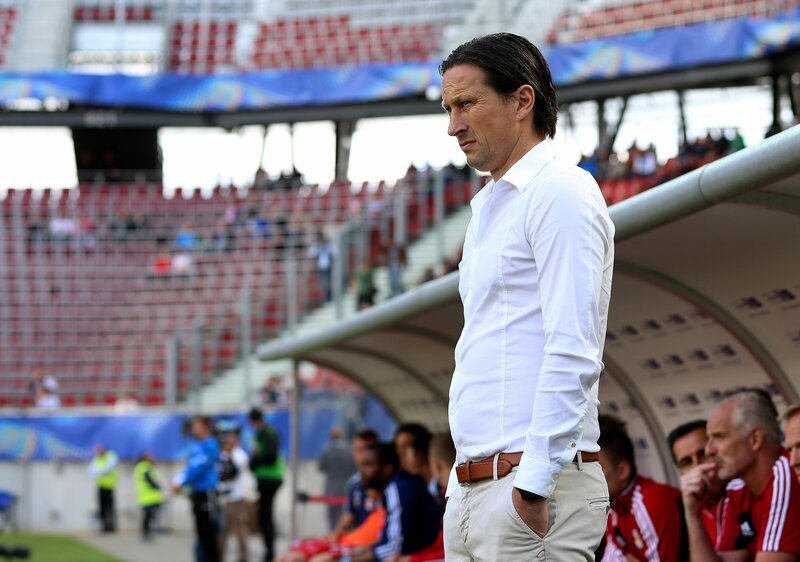 •	For Roger Schmidt, today was the 99th and final competitive match in charge of FC Red Bull Salzburg. •	Alan collected the 10,000 Euro prize for the cup’s top goalscorer with six goals in the competition. •	The Bulls are to meet tomorrow morning for a debriefing before some well-deserved holidays can begin. Training for the next season starts on 16 June. 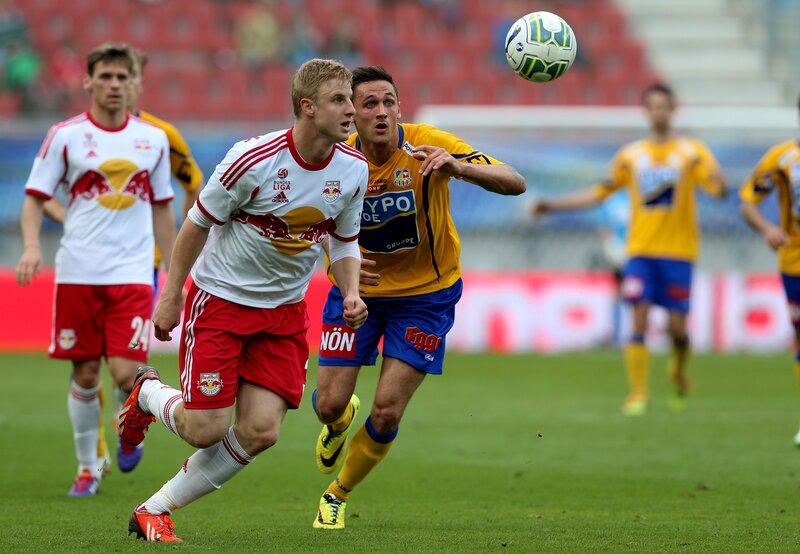 personally it was my last match for Red Bull Salzburg though." 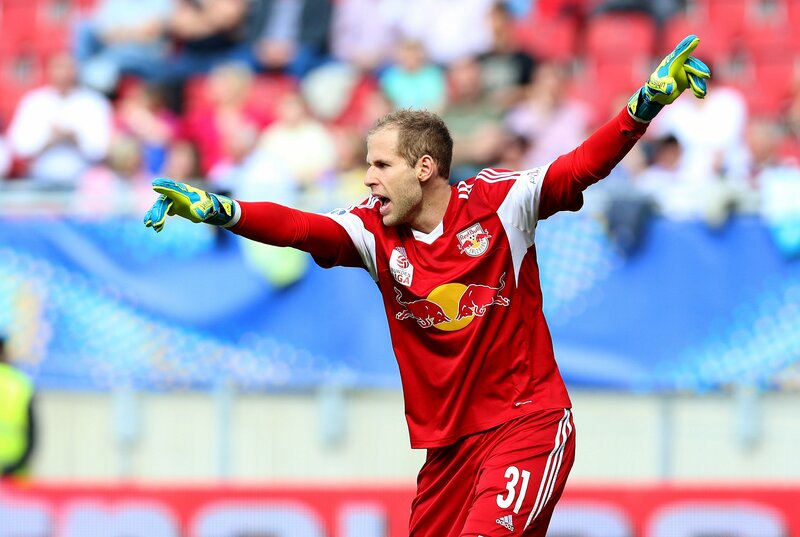 Line-ups: Gulacsi; Schwegler, Ramalho, Hinteregger, Ulmer; Ilsanker, Leitgeb; Klein, Kampl; Soriano, Alan. 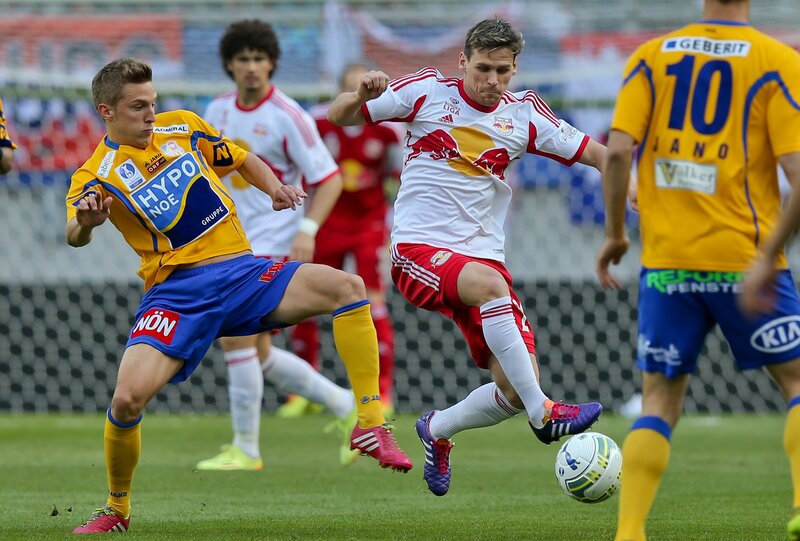 Off we go at the Wörthersee Arena, with the Red Bulls kicking us off. 4 minutes: St. Pölten threaten for the first time. Schwegler blocks Sadovic though before Ramalho can clear following a Hofbauer shot. 6 minutes: A Soriano free-kick gets blocked, as does Kampl’s follow-up shot. The ball then falls to Klein, who hits an effort over. 9 minutes: Dober plays a deep ball through to Hofbauer – and Schwegler clears. 13 minutes: Ramalho does well to get his body in Fucik’s way to stop an attack. 18 minutes: Kerschbaumer’s shot is deflected for a corner. 19 minutes: Kerschbaumer’s corner is headed clear by Klein at the near post. 20 minutes have been played. The game is a fairly even at the moment with few major chances at either end. 22 minutes: Kampl plays a pass for Alan to run onto. He gets blocked by Grasegger, however. 31 minutes: Soriano tries to hook a shot on goal from within the penalty area but gets stopped by Wisio. 32 minutes: Ulmer is prevented from getting a shot away by Sadovic. 34 minutes: A huge chance for the Bulls! Kampl supplies Alan perfectly, and he shoots but sees his effort get saved by the left foot of Kostner in the St. Pölten goal. 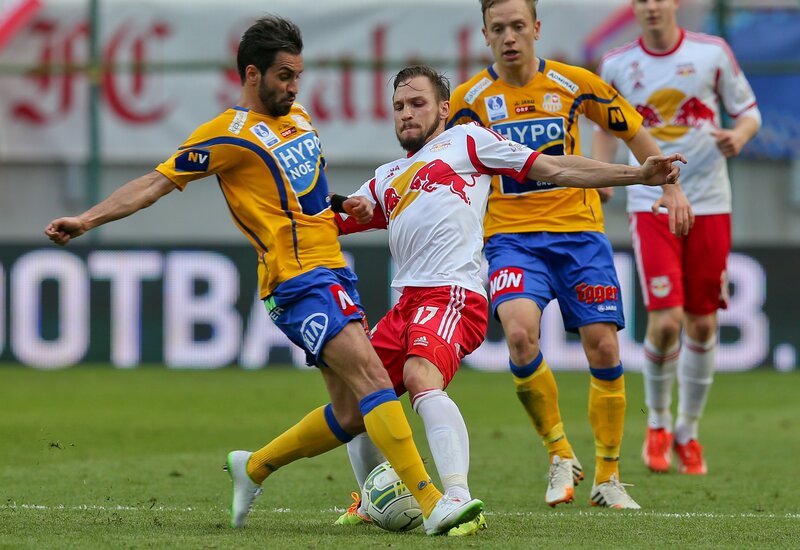 35 minutes: 1-0 to Red Bull Salzburg! After some magnificent supply work from Ilsanker, Klein beats Kostner with a crisp drive from the right! 38 minutes: St. Pölten launch a quick break, but Ramalho is alert to it and intercepts a pass from Kragl. 40 minutes: The equaliser. 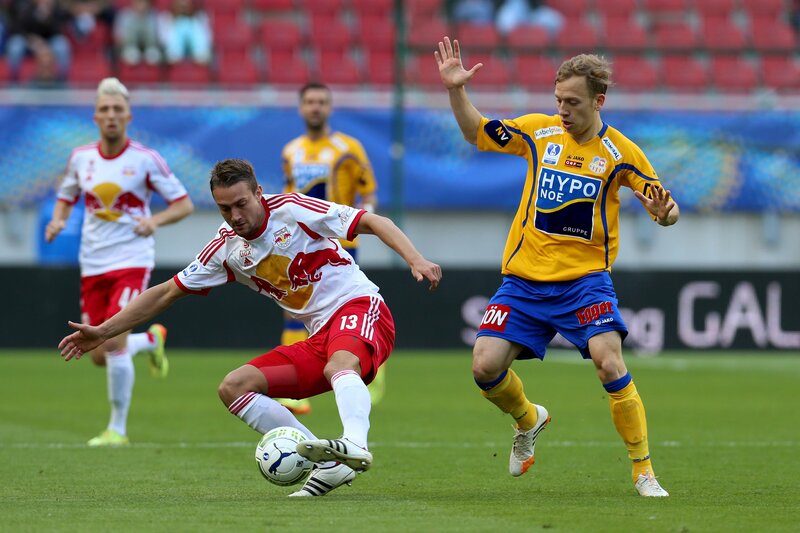 Jano nets, rushing past the entire Salzburg defence from a corner to head straight past Gulacsi. 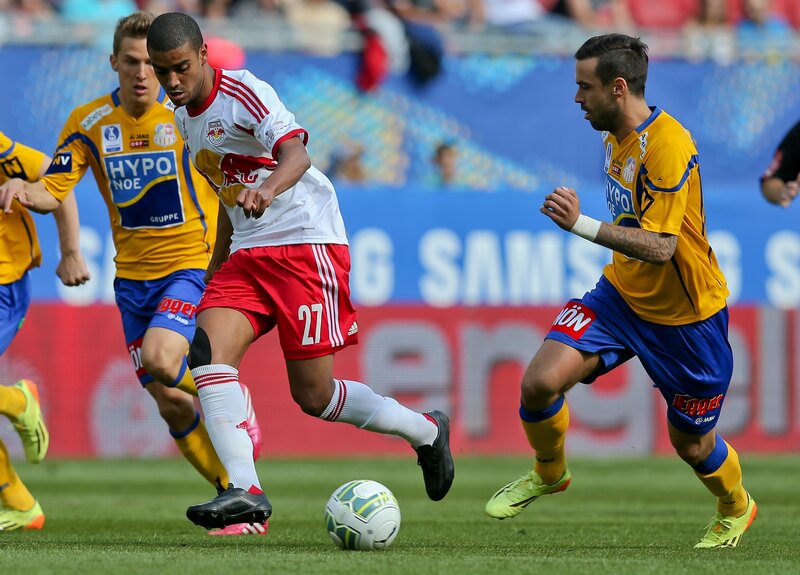 42 minutes: 2-1 for Red Bull Salzburg. Jano passes the ball back to Kostner and Klein sprints in between to deflect it onto Kampl, who does not wait around before lodging it into the net! Half-time. The Bulls have a slight advantage and are on course to complete the double. The referee, Dintar, starts the second period. 47 minutes: Sadovic heads the ball towards Fucik, but Hinteregger gets to it first. 52 minutes: Schwegler to Klein, who takes aim with his left boot on the turn. The shot is too tame to trouble Kostner, however. 55 minutes: Kampl hoists a free-kick high up into the penalty area, and Kostner claims the ball. 56 minutes: Soriano takes aim from the edge of the penalty area, and Kostner turns it behind for a corner. The corner creates all kinds of chaos in the St. Pölten penalty area. Klein manages to get on the ball, but his shot is blocked. 60 minutes: Noel spearheads a break and Hinteregger clears superbly. 62 minutes: A St. Pölten free-kick. Dober tries his luck from long range, hitting over. 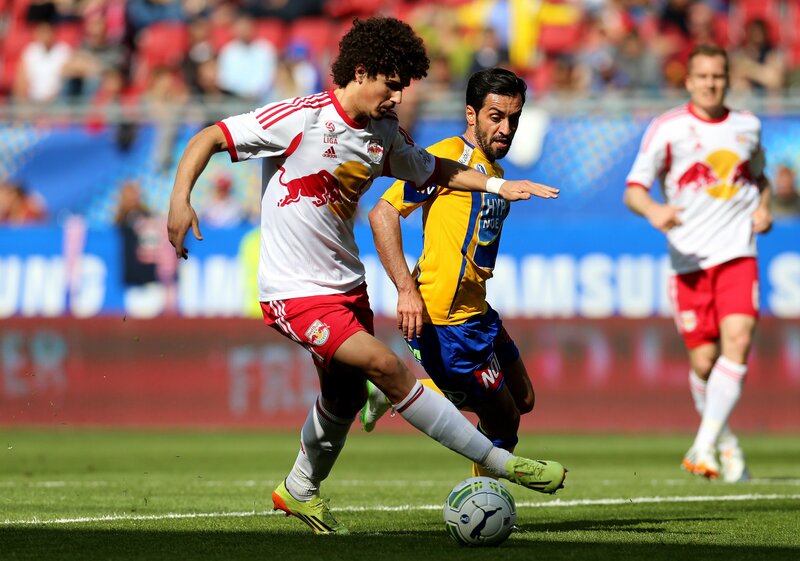 63 minutes: 3-1 to the Red Bulls! Berisha passes the ball to Soriano, who chests it down and has a shot on the turn deflected a little from Wisio straight past Kostner. 67 minutes: That’s the decider! Grasegger gives the ball away to Soriano. The striker bears down alone on goal and shoots tidily inside the left post to make it 4-1 to Salzburg. 70 minutes: The second goal comes for the second-flight side. Sadovic nods over to Noel who heads in for 2-4. 72 minutes: Klein can’t quite get onto the end of a Schwegler cross. 74 minutes: A Klein shot from around 16 metres out whizzes wide of the right post. 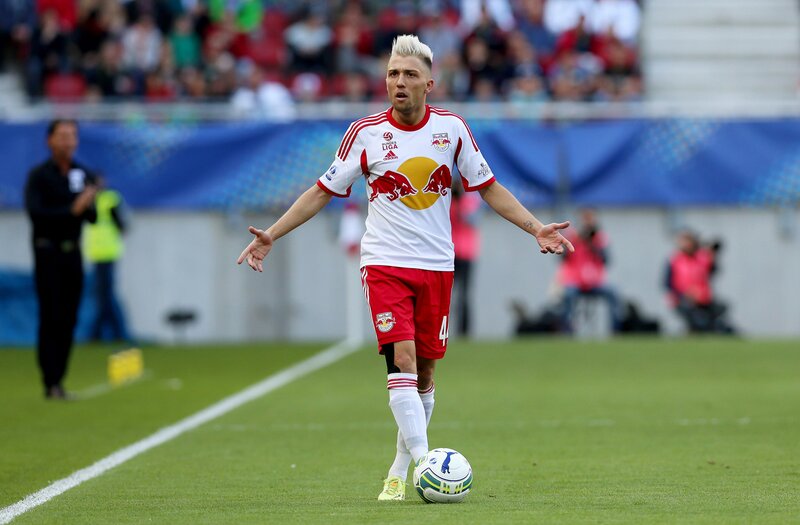 82 minutes: Kampl plays a magnificent pass to Soriano. Kostner does well to just get to the ball first. 84 minutes: A Soriano free-kick from afar is hit too centrally. After 93 minutes, the referee signals full-time on the final match of the season. 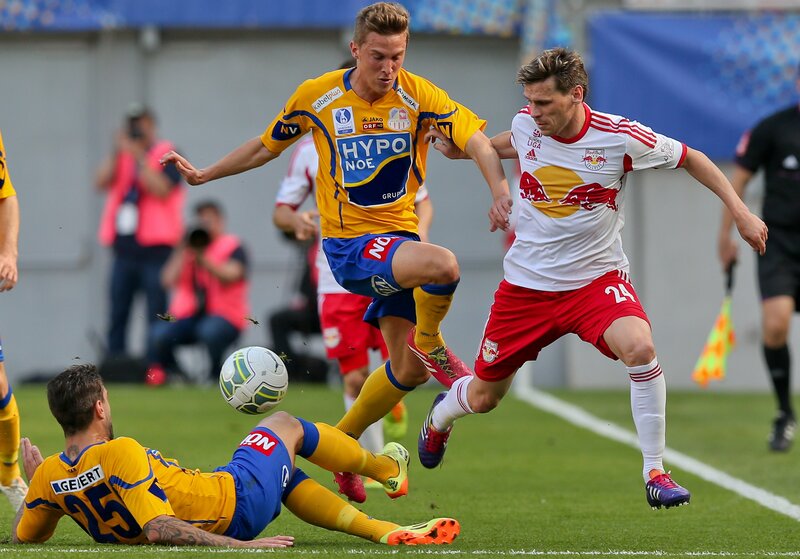 Red Bull Salzburg add the cup to their league success with a deserved 4-2 victory over St. Pölten! Well done!